The Men’s Wolves soccer team ended its season on a down note when it fell to Madison College in Region IV Quarterfinals on Oct. 13. The 2-1 loss left the Wolves with a 5-9-2 record for the season. Leonardo Haro, assisted by Christian Galvan, scored the first goal at the 5:43 minute mark putting the Wolves on top in the first half. However, the team was not able to hold the lead as Madison’s own Dejesus Herrera scored two goals within 10 minutes at the 80 minute mark, resulting in the end of the Wolves season. Goalkeeper Christian Aguayo had three saves, keeping the wolves afloat with his strong defensive presence. The sophomore ended his second season with the wolves on a positive note. Aguayo finished the season with 84 goals deflected with a .724 goals denied percentage placing himself at 15th in the nation on goals saved this season. Aguayo was not the only one putting up big numbers this season. Christian Galvan, Leonardo Haro, and Malek Rashid were players whose hard work and dedication of the sports were recognized. These players were all selected for the 2018-19 All-Region team. Galvan, Romeoville, was chosen for the first team while teammates, Haro, Joliet, and Malek, Romeoville, were selected for the second team to represent JJC and making us proud. Galvan himself had himself a great first season with the Wolves and ended his season with impressive stats. The freshman finished off the season with 11 goals, 32 points, and an impressive 10 assists in the season earning the 17th spot in the nation in assists for Division III sports. Haro was able to make his mark on the team with his active and heavy defensive skills set. The freshman was able to get himself two goals this season, although he is a defender. He was also able to get himself four points. Malek was another elite defensive weapon in JJC’s arsenal. The sophomore was able to earn himself one goal, two assists, and four points. He showed the ability to distribute the ball as well as defend it. 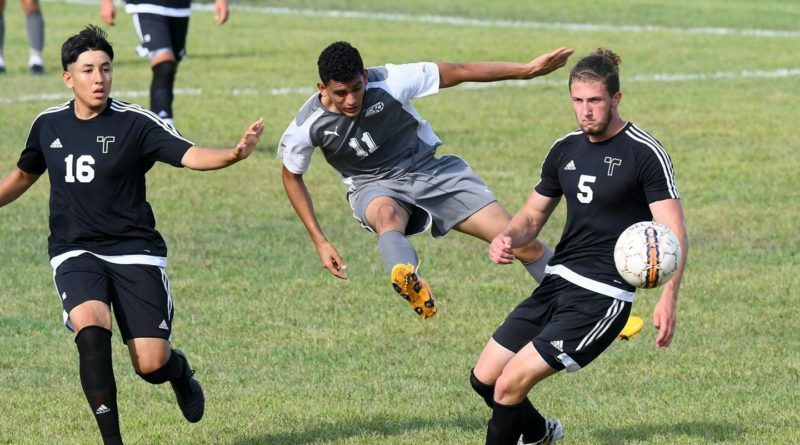 Overall the JJC men’s soccer team had themselves a good season with new players being able to showcase their talent and develop a presence to the competitive college soccer world. While returning players were able to advise, guide, and motivate their new teammates. The balance showed results on the pitch. The Wolves ended their season with 37 goals and 21 assists under Coach Cris Trillo, who has just concluded his 17th year with the men’s soccer team. The Wolves look to grow and improve for the next season as room for improvement is always on the agenda for Trillo.